Welcome to Rodeo Drive Condominiums at The Shops at Don Mills. Here, in Toronto's trendiest urban village surrounded by upscale shops and gourmet restaurants, you can live the life you love. Come home to stunning architecture, cosmopolitan amenities and a lifestyle inspired by Beverly Hills. Come home to Rodeo Drive. Rodeo Drive is situated at the CF Shops at Don Mills At Don Mills and Lawrence, A well – established neighbourhood. You are in the heart of Mid-town and connected to everything that matters. The TTC is at your door step offering fast connections to the subway and the upcoming LRT. The Don Valley Parkway is minutes away connecting you to all other major highways. The Neighbourhoods offers many public and private Schools,Golf, Parks, Ravine Trails, and Community Centre. It is close to University, Hospitals, Museum, Science Centre and more. Living at Rodeo Drive at the CF Shops at Don Mills is a spectacular community. All the services are in your backyard. Shopping for the latest fashions, going to the hair salon, picking up froceries or a bottle of wine for dinner, is all right outside your front door. Restaurants, shops, cafe's the theatre are all at your service. Or you can simply stroll outside and meet friends at thetown square. At Rodeo Drive, Everything is at your fingertips, Come home to Rodeo Drive. Presently, there is a vacant lot in this area, which was previously occupied by a post office branch of Canada Post. On the south of the site there is Flaire, a 15 storeys building currently rising, and further to the south there is Reflections, which is another new residential building at the Shops at Don Mills. The proposal mentions some 1154 underground parking spaces, with 828 being residential ones and 326 for commercial use or for visitors. There are going to be 565 bicycle parking spots available as well. However, this is yet to be seen to since technically 1 bicycle spot foe every unit is what is being requested in zoning requirements. Considering all this, it is a good idea to keep updated of the status and news about this development. 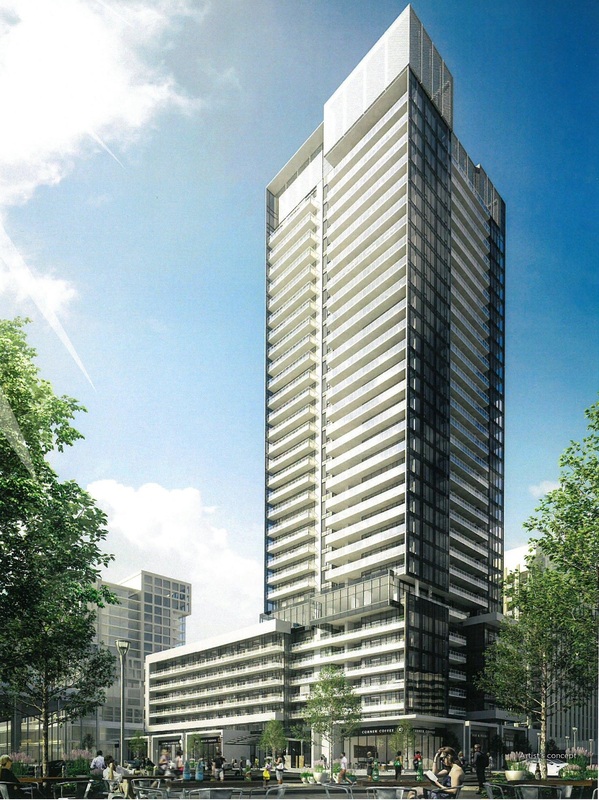 These condos promise to be very much in demand in this much sought after area of Toronto, and there is a nice variety of suites to choose from once the project is completed.